The Amazing Screw-On Head is a robotic agent for Abraham Lincoln in Mike (Hellboy) Mignola’s comic book and animated pilot. He is capable of attaching his head to various robotic bodies but I decided to stop at the neck. After basing a 3D model on the animated character, I imported it into Pepakura and converted it into a paper model. I then printed it out and assembled it. I sealed the paper with a coat of fiberglass resin. The screw at the base of the neck would be made separately. I slush cast several coats of plastic resin inside the paper until I had built up a wall thickness of 1/8”. The paper was sanded off and facets smoothed. A further refinement of the surface. I capped the neck with a disk of styrene and attached a cylinder of basswood to fit inside the screw shaft. The plug socket for the back of his head was cut from 1/4” MDF. The shaft of the screw was made from a 2” ABS pipe. I lathed the end cap from a scrap of basswood. The paper model screw was assembled as a guide. Led astray by the paper model, I originally made the screw threads reversed. 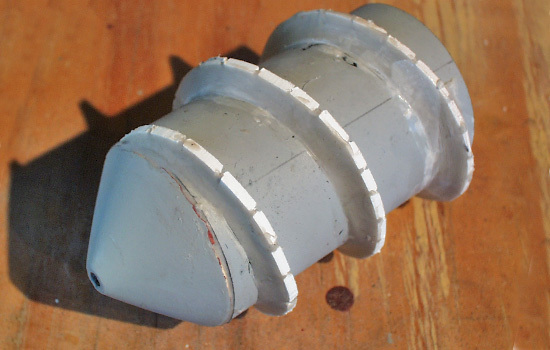 The correct threads were made by glueing styrene tabs to the pipe. I built out the bevel of the threads with epoxy putty and then sanded it smooth. The final painted Head standing on his stained display base. 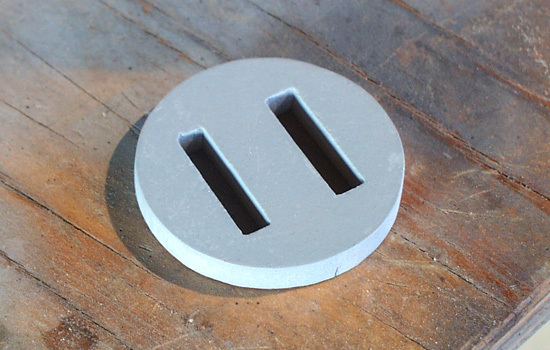 The secret of the stand…a nail is glued into the base that fits into a hole in the screw.